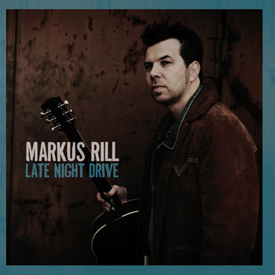 I first discovered Markus Rill a couple of years ago when he contacted me via this very website asking if I would be prepared to review his CD Wild, Blue & True. I can’t say that I was enamoured at the prospect of listening to a German-Americana act; but held an open mind as it had been released on one of my favourite labels – BLUE ROSE RECORDS. The album was truly excellent and the follow up, MY ROCKET SHIP (March 2013) was even better; so when he contacted me recently to say he was releasing a more intimate, solo album I was initially excited but wondered if he could match his previous efforts so quickly. Ha! What do I know? The album opens with Late Night Sunday Drive; a stripped back Country tune about a blue collar worker who has to leave home on Sunday evenings to travel five hours to his workplace not returning until late on Fridays; meaning his time with his family is incredibly precious; which Rill expresses in a way not heard since Springsteen recorded Nebraska. Jenny and Johnny is a heartbreaking love song about a middle aged woman looking back on her past and contains the haunting chorus ‘Jenny Used to Rock & Roll…..hey, hey…hey;’ and the minutiae that Rill includes about both characters and especially Rocker Johnny left me thinking it must surely be a true story hidden inside a song. A similar theme pervades Sergeant Dad, which could easily be a Tom Paxton song and is Folk song-writing at it’s very best, in my humble opinion. Without ever getting twee or gooey; love and romance enhance every note of this album and The Hardest Thing To See is a very late contender for my ‘song of the year’ as it struck a chord with me and puts to music how I too feel about my relationship with my wife of 36 years – what the Hell does she see in me? Like Markus Rill; some days I feel like the luckiest man in the world. The World’s Greatest Fool is a simple yet intricate clever song that should resonate with any man that has ever ended a relationship ……and lived to regret it; and the melody is excellent too. Late Night Drive ends with Beautiful Baby which ends with Twang encrusted Beautiful Baby in which Rill extols the joys and pitfalls of having a new baby and is surely written from experience; and will surely bring the house down if sung as an encore! Like all great songwriters Markus Rill has the knack of inhabiting all of the characters in his narratives making the listener ‘believe’ in the stories; so if you couple that skill to his fabulous tunes and a voice that sounds like it comes from the Americana heartlands; you have an album and artist that his hero Townes Van Zandt would be proud of.